Vaccinations save lives, but African countries almost always have to import the necessary serums. Now some governments are talking about producing vaccines locally - but it's not that simple. Africa's dilemma is clearly illustrated by two sets of statistics: Almost 17 percent of the world's population live on the continent - but it produces less than 1 percent of all the world's vaccines. And every year African governments spend millions on importing them. More and more politicians there are calling for a new approach. "We have a very big market today," says Christophe Bazivamo." In East Africa alone, we speak about 178 million people, and we're importing not only vaccines but also every kind of pharmaceutical product," he complains. Bazivamo is the deputy secretary general of the East African Community. This intergovernmental organization comprises six East African countries: Burundi, Kenya, Rwanda, South Sudan, Tanzania and Uganda. Will prices start to drop? "When I talk about manufacturing vaccines locally, my finance minister cries 'Hallelujah.' He hopes the prices will then go down," says William Ampofo. Ampofo is a professor of medicine from Ghana and the head of the Africa Vaccine Manufacturing Initiative (AVMI), a lobby group created by scientists and pharmaceutical companies joining forces. But Ampofo doesn't think local production will mean lower prices -- at least, not straight away. They would only be manufacturing small quantities, which means the vaccines wouldn't be any cheaper to produce than those of big foreign companies. Ampofo does a simple calculation to demonstrate why Africa could, nonetheless, benefit from local production. In 2014 alone, Africa governments purchased almost $900 million (€790.7 million) worth of vaccines for basic child immunization. If these were produced locally, 30 percent of the expenditure would remain in the country. "It makes economic sense to look at producing locally," Ampofo told DW. "You'll be building capacity locally, you'll be increasing your workforce, you'll be providing jobs for your younger population, you'll be bringing back home to Africa experts, expatriates who are living outside who have the know-how. I think for me it's a win-win." The pharmaceutical industry is interested, but not exactly euphoric about the idea. "We can imagine putting our equipment and our expertise at their disposal," says Manuel Batz, the director of Africa sales at the German pharmaceutical giant Merck. This is, after all, a billion-dollar market. In April the German Healthcare Partnership, an initiative of the Ministry of Development together with the Federation of German Industry, organized the first East African "vaccination summit." Batz estimates that, from a technical point of view, they could start producing within two years. But before that they would need clarification on some central questions. "The issue is profit," he says in a DW interview. "Anyone who invests in a manufacturing plant with fill and finish vaccines needs to have the assurance that the vaccines will be bought at a certain price for a certain time to have a safe investment environment. Here the local government will be the main customer, but will only source if the cost of the locally filled vaccines is not much higher than the cost of vaccines sourced from India." 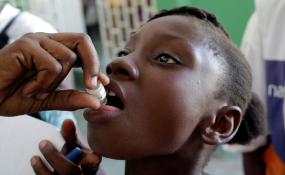 However, many governments are biding their time - because poor countries can get low-priced vaccines through the international vaccination alliance, GAVI. This changes, though, when living conditions improve - which is why the medical professor William Ampofo is calling for things to move faster. "It's a very difficult process," he admits. "But if we don't start now, we'll still be sitting here talking in five years' time."